Statutory Origin: Senate Bill 3 Substitute 1 1969. We were created in 1969 by a line item added to the minimum school program. The Senate created us after a successful pilot program funded by Federal grant money. In 2001 our line item was moved from the minimum school program to the USOE budget. Regional Service Centers were inadvertently removed from State Code at that time. In 2011 Rep. Last ran and passed House Bill HB 92 Substitute 1 “Public Education Regional Service Centers.” That bill put us back into state code and required that we create an interlocal agreement between the districts we represent and submit an annual report to USOE. Structure: The 26 rural school districts are organized into four service regions. See the attached map. Each regional service center is governed by a Board of Directors consisting the District Superintendents and Charter Schools in their region. Each center has an Executive Director, an Administrative Assistant, a Network Engineer and Technology Trainer. Other positions have been added in each region depending on the needs of the school districts within each region. Purpose: Utah's four Regional Service Centers were established to assist school districts in providing equitable and cost-effective services and programs for students in rural Utah to match those offered to students on Utah's urban Wasatch-front. Basically we were created to save districts money by pooling purchases and services to build economies of scale for small school districts. 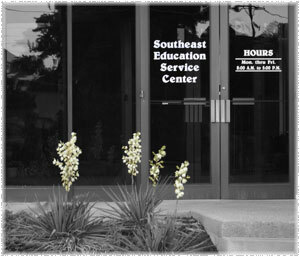 The service centers run joint programs like the Utah Rural Schools Conference, various grants and technology purchases. Geographic Scope: See the map at the left. The four school districts of Carbon, Emery, Grand and San Juan make up the Southeast Region of Utah. These four districts encompass 17,455 of Utah's 84,916 square miles, or 21% of the Utah's total area. There are nine states within the USA that are smaller than 17,455 square miles in total area. Legislative: The four Service centers are also part of an organization called Utah Rural Schools Association (URSA) which organizes the Thursday afternoon meetings on the hill during the session. Each service center plans an annual dinner and business meeting with legislators to discuss items related to education.